April showers bring May flowers, and also a good chance to get in some spring cleaning! If you find that you have any of the above problems in your facility than you need to call our team of professionals. Our crews can clean any size job from small executive suites all the way up to multi-tenant commercial buildings. We clean all sorts of facilities throughout Northeast Ohio from financial institutions, professional buildings, medical offices and much more. Our crews are trained to ensure a thoroughly cleaned, sanitized and disinfected environment. We bring our extensive cleaning knowledge, utilizing methods and products, to help prevent cross contamination. We use state of the art equipment to remove soils hiding deep within your carpet, as well as focused stain removal. Other services to help your spring cleaning include upholstery and drapery cleaning, hard floor cleaning and care and deodorization. A clean environment is a healthy environment. We can help improve your work spaces this spring. 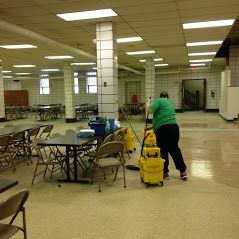 If you need a deep clean or daily office cleaning we are the company to call SERVPRO of Stark County at 330-497-1773.